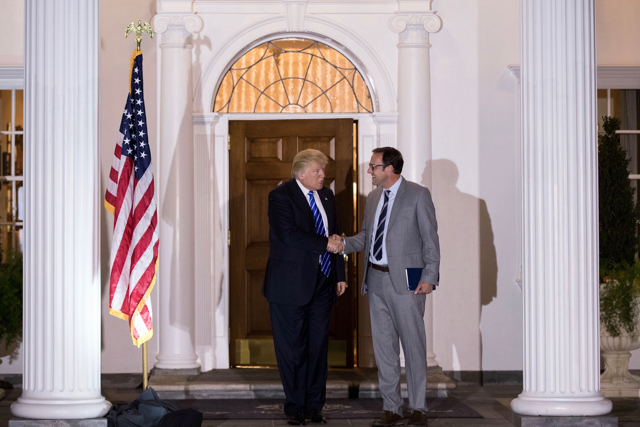 President-elect Donald Trump on Wednesday named Todd Ricketts, the head of one of the 2016 election’s top-spending dark money groups, to be deputy commerce secretary. Rickets, a co-owner of the Chicago Cubs, led two outside organizations that spent millions supporting Trump’s candidacy. He ran 45Committee, which, as a politically active nonprofit, can accept unlimited funds without revealing its donors. The group reported spending just over $21 million on ads supporting Trump. The vast majority of its spending occurred in the last month of the race, including a $13 million media buy on November 2. The 45Committee ranked third among top-spending dark money groups this election cycle, behind the National Rifle Association’s Institute for Legislative Action and the U.S Chamber of Commerce. Ricketts also ran a super PAC, Future 45. The group, which can accept unlimited funds but has to reveal its donors, spent roughly $24 million on ads opposing Democratic nominee Hillary Clinton. Ricketts and his family were initially part of the “Never Trump” movement, prompting a tweet from then-candidate Trump warning the family to “be careful.” They switched their position, however, after the real estate mogul became the GOP’s presidential nominee. According to Politico, Ricketts raised money for 45Committee by courting big donors who were reluctant to be publicly identified with Trump; by giving to the politically active nonprofit, they could support Trump’s presidential bid without having their names revealed. Trump promised to “drain the swamp” during his presidential campaign, but his naming of Ricketts Wednesday adds another top Republican donor to his roster of advisers and appointees. He named Rebekah Mercer to his transition team shortly after the election. Mercer oversaw a super PAC that spent millions supporting Trump’s presidential bid. Silicon Valley investor Peter Thiel, who pledged $1.25 million to support Trump’s campaign, is another top adviser. Trump’s transition team also has strong ties to dark money organizations linked to Charles and David Koch, the billionaire brothers who run Koch Industries, the nation’s second-largest privately held company despite the libertarian-leaning Kochs putting their donor network’s resources toward supporting Republican U.S. House and Senate candidates, not Trump’s presidential campaign during the 2016 election cycle. Vice President-elect Mike Pence has appeared at Koch network events, and many of his staffers once worked in Koch offices. Marc Short, who served on Pence’s Congressional staff and is now a senior transition team adviser, recently headed up Freedom Partners, a dark money group that has been described as the Koch network’s bank. Rep. Mike Pompeo (R-Kansas), Trump’s choice to lead the CIA, is the top recipient of contributions from Koch Industries this election cycle. And Myron Ebell, a climate-change skeptic in charge of the transition at the Environmental Protection Agency, is the director of the Center for Energy and the Environment at the Competitive Enterprise Institute. The institute is a think tank funded in part by Donors Trust, a dark money group staffed largely by Koch network insiders.